I have been grilling forever I guess and caught the smoking bug 20 years ago. I started with a Brinkmann Smoke'N Grill moved to a WSM then my first big smoker was a Klouse offset, then a Pitmaker safe insulated cabinet smoker. 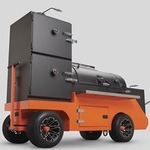 I have been checking out just about every pellet smoker out there and finally got a YS640 with a comp cart. I have only a few smokes on it but so far I really like it. I think the ease of operation is what sold me on a pellet smoker. What sold me on the Yoder was the construction of the unit.